There is a certain romance to what we imagine 19th-century train travel in Europe might have been like, but there's no denying the benefits of modern technology on Italy's rail infrastructure. The country's high-speed trains connect Italy's major cities, with even more routes being planned and under construction. Trenitalia's high-speed trains are called Alta Velocità (AV), and are broken down into three categories: Frecciarossa (“Red Arrow”), Frecciargento (“Silver Arrow”), and Frecciabianca (“White Arrow”). Frecciarossa trains are the fastest of these, reaching speeds of up to 190 MPH (300 km/h). The AV train network connects Turin, Milan, Bologna, Florence, Rome, Naples, and Salerno. Italo's network, which operates on a different set of rail lines, connects Turin, Milan, Venice, Padua, Bologna, Florence, Rome, Naples, and Salerno. These routes make it possible to consider day trips from Milan to Rome or Rome to Naples, despite the great distance. Italy's high-speed trains help evoke the 19th century romance of rail travel, albeit at 21st-century speeds. The Alta Velocità are the premiere Italian high speed trains with increased scheduling frequency that operate on routes connecting Italy's main cities and towns. Arrive in style! Whether you are a frequent traveler to Italy or not, there are many ways to book your railway travel. You may opt for the city to city tickets, or purchase a country pass. In either case you will be serviced aboard one of their high speed trains. We hope to make your journey fantastico! 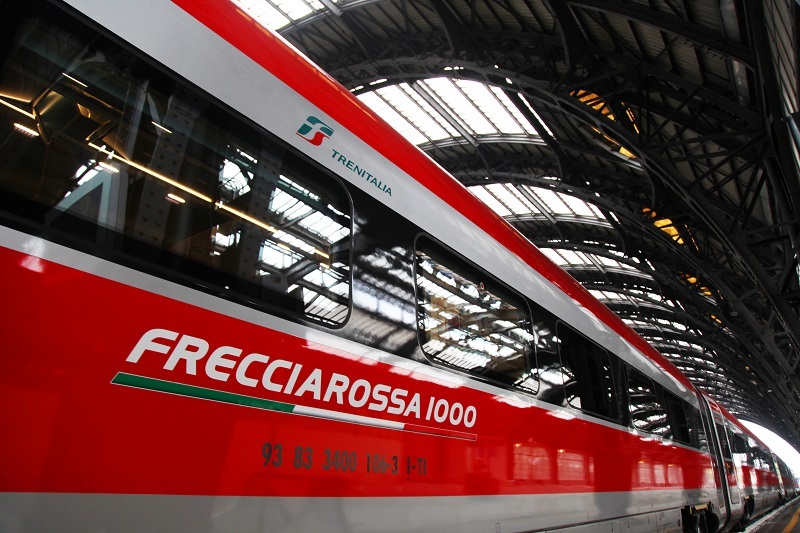 The Frecciarossa trains connect Turin - Milan - Bologna - Rome - Naples - Salerno. The trains are the fastests of fast, reaching speeds of over 220 mph, with over 72 daily connections between the cities, some of which are non-stop service. The Frecciargento trains connects Rome to Venice, Verona, Bari/Lecce, Lamezia Terme/ReggioCalabria on both high speed lines and traditional lines. Frecciargento trains can reach speeds of 155 mph. The Frecciabianca trains offer service on traditional lines from Milan to Venice, Udine, Trieste, Genoa, Rome, Bari, and Lecce. Frecciabianca trains can reach speed of 125 mph. ES Italia are trains connecting Rome to Ancona, Genoa, Lamezia Terme, Reggio Calabria, Perugia, Ravenna, Rimini, Taranto. These trains are being replaced by the higher capacity super fast trains of Frecciarossa, Frecciargento and Frecciabianca. Intercity trains connect major and minor cities in Italy to meet the different mobility requirements of medium to long distances. With 86 daily connections, Intercity trains reach 200 stations in Italy. Night trains have both traditional seating and sleeping compartments, often called couchettes. These services provide travelers with a versatile way to traverse the country, especially on the longer journeys. Eurail Pass and ticket holders are accepted on Italian high speed trains, and pay a supplement fee including the mandatory reservation, which is necessary. Supplements are non-refundable.